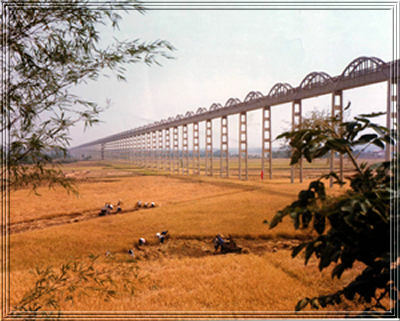 Hunan is a big agricultural province. It is honoured “the barn for Kyushu (the poetic name for China”, and " A place of fish and rice". The total soil area is 211800km?. There are 48740000mu under cultivation, 256,000,000mu hilly area, and 20430000mu-lake or river area. The total population is over 65,000,000. There are 48,000,000 rural people, and it takes over 74% of the total population. The heat resource in the province is rich. The illumination is plenty and the frost-free period is long. There are many kinds of special animals and plants, and the forest resource is rich with great developing and utilizing potential. The rank of the land, which is suited for cultivation, is at the eleventh of the nation, and the resource of seed plant takes one-seventh of that of the nation. The water resource per person is 1.5 times to that of the whole nation. Hunan is a big agricultural province worthy of name not only for the climate, living-things, soil, water and other natural resources, but also for rural working force and other social economic resources. The main agricultural products of Hunan take an important place in the nation. The grain output takes the seventh in the country, and the rice output takes the first place in the country. The output of ramie is the first in nation, and the output of tea takes the second. The output for orange takes the third place. 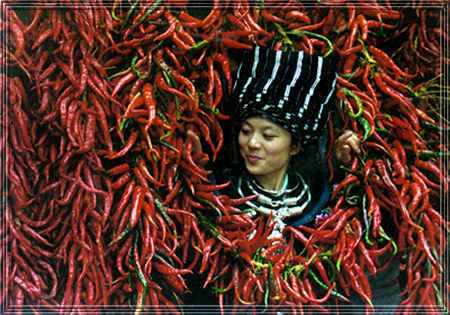 The famous special products are daily lily, Xiang lotus, fresh ginger, dried mushroom, Job’s tears, hot pepper, etc. The output of animal husbandry and breeding industry is also at the top place in the country. In livestock and poultry, the most famous products are pig from Ningxiang, buffalo from Bin Lake, ox from the West of Hunan, goose from Wugang, duck from Wuling, sanhuang chicken from Liuyang, fenghuang chicken from Taoyuan, etc. The natural condition for producing aquatic products is good enough. There are 160 kinds of fish. The main economic kinds are over 40, such as black crap, grass crap, silver crap, crap, variegated carp, crucian carp, brean, and so on. They are not only of high output, but also of delicious tastes. There is some rare fish, which is rich of nutrition, such as hilsa herring, whitebait, eel, ricefield eel, soft-shelled turtle, etc. The high economic value water plants are lotus, water chestnut, strass for mat, the leaf of cattail, reed, etc. In general speaking, on 3.2% of the national cultivation area, Hunan people produce grain which takes 6% of that of the nation, 8% cotton, 13% orange, 6% rapeseed, 11% pork, and 8% freshwater aquatic products. It not only provides important material base for the provincial economy and social development, but also makes a great contribution to the sufficient supply to the whole country and making exchange.